Ahhh Sehgahunda….English meaning: Vale of Three Falls…once home of the Native Senecas. Since 2010, we’ve hosted a trail marathon (26.3 miles really) from Mt Morris Dam to the Parade Grounds of Letchworth State Park. Since inception, this event immediately came with a personality, a demeanor, an attitude that athletes quickly realized they should never mock and only respect, a very diva-esque persona that changes each year to be kind or mean; hence with the greatest of appreciation has now been described as Lady Sehgahunda. It is the wildest thing, because none of our other events come with an identity like that. Each year you never know what will be unleashed on the athletes. It’s seen mud conditions likened to running through peanut butter. It’s seen gruesome heat. It’s seen gullies filled with little ponds completely engulfing feet. And it’s seen good conditions like this year….dry trail even after the crazy rains of spring, although the journey to the checkpoints still brought an onslaught of mud that people pay hundreds for to make their skin silky smooth. Add to it, the temperatures were perfect with a clear day. You either hate her or love her and often can interchange in milliseconds. While I’ve never run Sehgahunda I have indeed felt her wrath personally working the event and seen what she has done to others egos, appreciation for running, determination, psyche and even people’s bodies. Well, after last year’s race when discussing the event with local officials, for some reason I said yes to Boots when he casually stated…..Hey let’s add a second day AND it will be a 5K, 10K and 15K AND people can do both days AND we can rent all the cabins to participants so we have access to that part of the park AND we can have medals after each race AND … AND…. AND…. AND I for some weak, non thinking, irrational moment said YES. How in the world did I forget that I really don’t like her. She’s really really hard. I see and feel what she does. Cry…..Yup….each year and I’m not a crier. But each year I get moved by something, someone. This year while on the mic I had a few moments where I had to pause or try not to have my voice crack. The first instance actually occurred when I was saying “On Your Mark..” for the women’s race, the first race. I’m not really sure why, perhaps because things were going fairly well leading up to that moment, which usually the days and minutes leading up to Sehgahunda can be quite harried. But there it was, the solo women were off to see what they could do. I recall saying “If you are good to the Lady, she’ll be good to you”. The second almost always happens the last hour of the 26.3 miles because it’s this hour where you know those athletes showcase incredible will, desire and determination. The 4PM cutoff is rearing its ugly head and they know it. I was following along with Matt Underwood as he was pretty much the last person into each checkpoint and towards the end with seconds to spare to race time cutoff, the amazing volunteers shoved him back on course at CP 6 so he could make it. You see, Matt, has had complete reconstruction of his leg, now filled with rods, pins etc… He has wanted this race for two years, but had an accident that changed his life, almost losing his leg. He was training to “run” Sehgahunda two years ago, but, well….then he couldn’t. Had to relearn how to walk, had two surgeries and lots and lots of pain. I’ve watched this transition firsthand from runner, to crutches to trekking poles as he had an army of people helping him gain back his steps to get to this start line. A dream from two years ago. At the last two checkpoints he started gaining time. Somehow. But all of a sudden as my contacts informed me h e was on his way, watching the clock, knowing anything can happen. There he was turning the last bend to the finish. Unbelievable, especially because he somehow had a fire under those poles that allowed him to finish with 13 minutes to spare. Tears trickled from my eyes. Another moment was seeing the Sehgahunda 72ers coming in after the doing Day 1 and all events on Day 2 total distance equaling 72K (with rounding that’s 45 miles). In this scenario was Caitlin O’Dell. She had a wide smile all weekend long, she looked effortless and excited each time I saw her and as she approached the finish line after the final 15K race, I recall calling her name and you can just see her putting her hand to her heart, tears starting to fall, disbelief at what she just conquered as if she had just won a million dollars. You know that moment when you realize you accomplished something so hard and it hits you as if saying to yourself, I just did this! Did I just do this? Watching that joy as she is holding onto a few flowers in her hand was such a wonderful moment. There indeed are others, and I know tears were shed by others. Cuss…Fine….this is a given, I’m a cusser. But I’m from Long Island and this Lady makes me so furious my language choices falter. A LOT. This year oddly was different. I actually cussed less. Much Less. Admittedly, I did ask my staff during a midweek Sehaghunda prep stress moment (a usually cuss worthy) for some gum, cigarettes or beef jerky instead of stating bad words. They only had gum to console me. But seriously, this year the YellowJacket Racing team worked so well from start to finish getting this prepped, ready, produced and cleaned up. 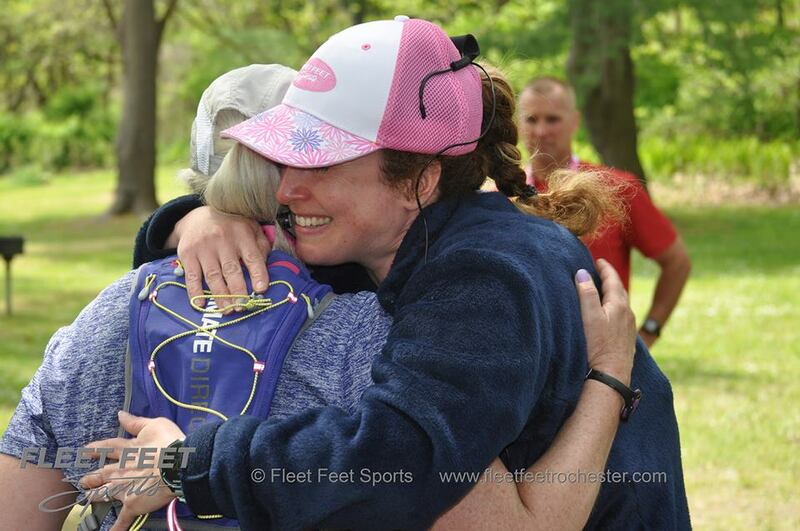 The Fleet Feet Sports Race team gave their incredible support when asked. And the volunteers were spectacular as usual. And of course the weather. Lady Sehgahunda gave us a great day. Smile…While Lady Sehgahunda can put its fury on athletes even on good days like this weekend, she in the end tends to make you smile. Think of that difficult teenager that just keeps digging and digging at your anger and frustration strings, but then becomes this incredible young adult that makes your heart melt. That’s Sehgahunda. 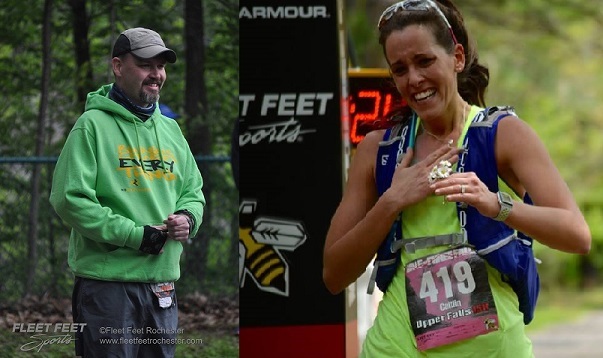 In the end, for many, sadly not all, but for many she gives you the pleasure of seeing great joy, great strength, great determination and of course incredible inspiration, like Matt and Caitlin. Even for those who may not make it through that year, inside them get this “thing” that says “I’m coming back for you”. I’ve seen it over and over again. And then the day comes and the athletes finally see that finish line and gets that handmade arrowhead medal around their neck. At the finish, I am fortunate to witness this. The smiles, the jubilation. Never gets old. And finally..Lady Sehgahunda Makes Me Wanna…..Hug…… Gosh the stories each person carried with them this weekend. I don’t know them all, but I know some of them. It’s a long weekend, now with its 2 days. Why did I say Yes to Boots on that? Our crew is exhausted after long days even before Saturday occurs of getting things nailed down. I know Boots is shot. I’m shot. I even ran the Lower Falls 5K to act as caffeine booster because I knew I still had 7 more hours till my bed became my destination. Then the final race, the Upper Falls 15K. There were 18 participants left in the Sehgahunda 72 category. One of whom was on the cusp. As she finished the 10k with minutes to spare, she got to the 15K start telling me, I’m not gonna make it. I’m not gonna make it. And I just said, I know you. You will make it. Off she went. She was someone who was with us from the conception of Sehgahunda. Even in its creation, she was someone Boots thought of as one to appreciate the wrath Sehgahunda can bring. An extremely accomplished endurance runner. I recall seeing her name as one the 24 initial Sehgahunda 72ers before race day. And here she was on the final leg – 9.3 miles of grueling hilly, yet picturesque terrain. I know her because she was a former employee and have watched her in many events. Boots, Barb, Myself and our staff, along with friends and teammates were with Kim Rapp long ago when she ran 24 hours straight on a treadmill for American Heart Association at our old store on Monroe Avenue. Personally, I even cooked her food in the middle of the night during that rough 2am-4am hour and she kindly ate my cooking. No one does that. So, I knew she had that umpphh in her. I’ve witnessed it. Sunday as each 15K finisher including 72er crossed the line, those last few 72ers were cutting it so very very close to cutoff. The minutes ticked away and one by one they are coming….then word comes Kim is nearing. Anxiously awaiting, I ask everyone there to come to the finish line to cheer her on. Here we are again, the last hour of a really hard event and the anticipation rises. And then there she is. Last turn. Step by step. We are all cheering. She comes through the line, I have her medal and plaque in hand. She looks at me and says, “I didn’t make it!”. I look straight at her and say, “Yes YOU DID!”. Right there, that Lady made me wanna Hug. For me personally that hug had a huge meaning. It was serendipity that it was Kim who was that finisher. One of 18 Sehgahunda 72ers. Someone who knew this event from day 1. Someone who knows us. Someone who has witnessed everything Lady Sehgahunda makes me wanna do….But it also represented every athlete out there who has trepidation in finishing, who has determination in finishing and in the end simply inspires in finishing.